Bob Dylan is the subject of yet another artwork. 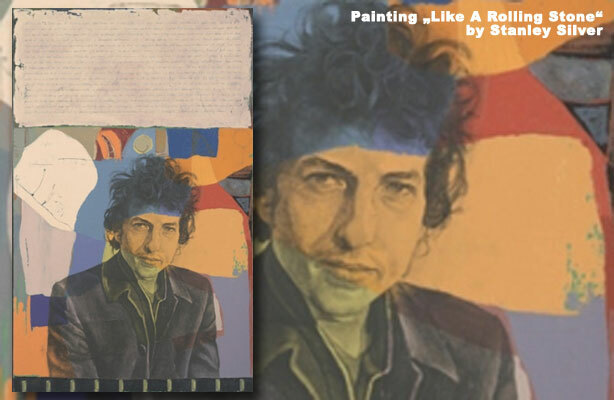 The oil painting, named after Dylan's all-time-classic "Like a Rolling Stone" from 1965, has been created by Stanley Silver, an artist from Los Angeles, who's collectors include, George Clooney and David and Courtney Cox Arquette. His art has been shown at some of the most prominent galleries and museums in the U.S., recently he was featured at Blythe Projects in Culver City. His work has also been named the “official art” for many of sports most prestigious events including the World Series, NHL All-Star Game, and New York Marathon. Growing up in Los Angeles, surrounded by Hollywood stars and champion athletes, Silver developed an intense interest in capturing life through his art. It spotlights the impact of sport and celebrity on our culture. You can visit the artist's website at stanleysilver.com, or follow him on facebook or twitter.